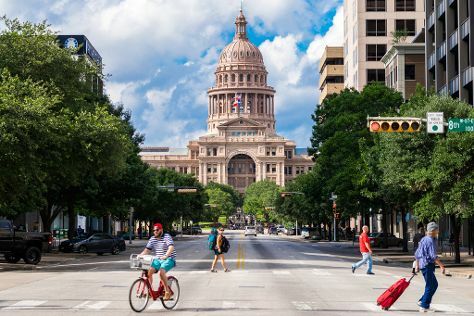 Kick off your visit on the 23rd (Sat): contemplate the long history of Texas State Capitol and then hike along Lady Bird Lake Hike-and-Bike Trail. Get ready for a full day of sightseeing on the next day: pause for some photo ops at Stevie Ray Vaughan Statue, then see the interesting displays at LBJ Presidential Library, then take an in-depth tour of Bullock Texas State History Museum, and finally get your game on at The Escape Game Austin. To see traveler tips, other places to visit, ratings, and more tourist information, read our Austin sightseeing planner . San Diego to Austin is an approximately 4.5-hour flight. You can also drive; or take a bus. The time zone difference when traveling from San Diego to Austin is 2 hours. Traveling from San Diego in March, you will find days in Austin are somewhat warmer (75°F), and nights are about the same (53°F). Wrap up your sightseeing on the 24th (Sun) to allow time to drive to Fredericksburg. Kick off your visit on the 25th (Mon): get engrossed in the history at National Museum of the Pacific War, indulge your taste buds at Food & Drink, and then make a trip to Main Street. To see more things to do, ratings, traveler tips, and tourist information, read our Fredericksburg trip planner . Traveling by car from Austin to Fredericksburg takes 2 hours. Alternatively, you can take a bus; or do a combination of train and bus. Traveling from Austin in March, Fredericksburg is little chillier at night with lows of 46°F. Wrap up your sightseeing on the 25th (Mon) to allow time to drive to San Antonio. On the 26th (Tue), shop like a local with The San Antonio River Walk, browse the exhibits of The Alamo, then take in the history at Mission San Jose, and finally admire the architecture and history at Mission Concepcion. On the next day, explore the fascinating underground world of Natural Bridge Caverns, then explore the world behind art at McNay Art Museum, and then take in the architecture and atmosphere at San Fernando De Bexar Cathedral. To see photos, maps, and more tourist information, refer to the San Antonio trip maker site . Drive from Fredericksburg to San Antonio in 1.5 hours. Alternatively, you can take a bus. Plan for a bit warmer nights when traveling from Fredericksburg in March since evenings lows in San Antonio dip to 54°F. Cap off your sightseeing on the 27th (Wed) early enough to travel to Dallas. On the 28th (Thu), take in nature's colorful creations at Dallas Arboretum & Botanical Gardens, then examine the collection at The Sixth Floor Museum at Dealey Plaza, and then take some stellar pictures from Reunion Tower. For maps, photos, traveler tips, and tourist information, you can read our Dallas trip tool . Fly from San Antonio to Dallas in 3.5 hours. Alternatively, you can drive; or take a bus. When traveling from San Antonio in March, plan for slightly colder days in Dallas, with highs around 70°F, while nights are about the same with lows around 50°F. Finish your sightseeing early on the 28th (Thu) to allow enough time to travel back home.